Nothing takes away the stresses of a long day quite like relaxing in your favorite comfy PJs with a good glass of wine. We have combined both of these beloved things in our comfortable and chic Rise and Wine nightshirt. Show your playful, wine loving side with fun sayings like “You Had Me At Merlot”, “#ILoveWine”, “#PopFizzClink” and “Be There in a Prosecco”. 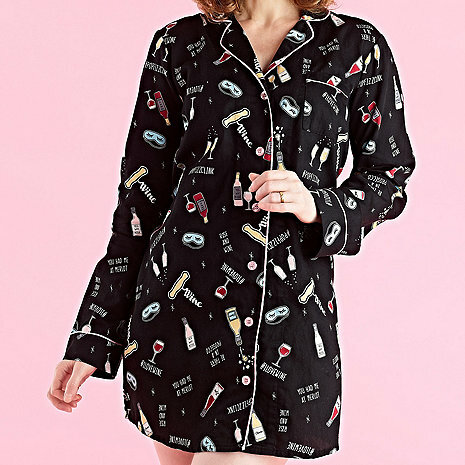 Nightshirt offers a classic button down design with cuffed sleeves and a chest pocket. 100% cotton, with relaxed fit for max comfort and sweet dreams. S, M, L, XL. Also available in PJ bottoms. Machine wash.
what is the length of the night shirt? BEST ANSWER: Lauren, Here are the lengths of the sizes: XS = 33", S = 33 1/2", M = 34", L = 34 1/2", XL = 35". Thank you! These are good high-quality pajamas. The short is perfectly sized for a women's small (think 1990s' tee-shirt length), although the pants are a bit long, even in the Small size. Still, they are cute and comfortable.